The UCULeft Autumn conference will take place on Saturday 18th November. *Dennis Leech, Sam Marsh UCU on USS. FE workshop on curriculum: Speaker: Naia Bazin Lopez, Co-Director: Movement Building People & Planet. Young people entering the world of work are facing more challenges than ever as jobs become more precarious and workers rights are eroded. What can teachers do to support the new generation of workers to assert and defend their right? Join us to explore engaging and practical ways to teach about workers rights, precarious work and the role of unions. Based on the recently published book The Principal: Power and professionalism in FE, which uses Machiavelli’s The Prince as a metaphorical guide to leadership of all kinds in FE, this workshop will examine how power is wielded and resisted in colleges. Machiavelli has relevant advice for principals thrusting their way to the top as well as for trade unionists defending employment rights or teachers applying critical pedagogy. “One must be a fox in order to recognize traps, and a lion to frighten wolves,” Machiavelli tells us. Come along to hear about this new book, which “shines light on the dark arts of political street fighting in colleges”, and come along to analyse power and professionalism in FE. The Conservative Government looks unable to govern the country, the Labour Party is waiting to form the next government. Labour’s radical manifesto contains many post-16 education polices developed by UCU. This conference will look at developing education policy in anticipation of a future Labour government. The conference will look at a wide range of areas covered by post-16 education to discuss and design policy that will ensure a progressive Further and Higher Education sector is developed that allows access for all. The conference will look at apprenticeships, more relevant and inspiring curriculum and the role of adult education in Further Education. The conference will discuss how we can undo the marketisation of Higher Education. One of the main themes of the conference this year will be the issues of the public sector pay cap and how we can build a movement to get the cap lifted. The stunning CWU ballot result to defend pay, pensions and conditions shows what is possible. UCU members in FE have voted for a strike on pay in an e-consultation. 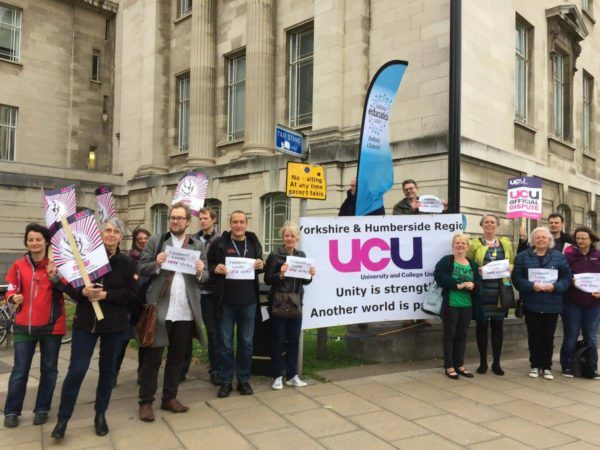 UCU USS members have voted for strike action to defend pensions. We are in the fight of our lives to defend pay and pensions. There is a real opportunity to unite UCU and the wider trade union movement to break key austerity policies and win for members. This conference is relevant to everyone working in post-16 education who wants to defend education and academic freedom, fight austerity and oppose racism.